SWAC 4th of July ... Smalltown U.S.A. If you're looking for a good old-fashioned 4th of July celebration, look no further than the SWAC area for displays of American flags, bunting, fireworks, and picnics celebration America's Independence Day. Staunton's America's Birthday Celebration committee has the lineup of events for Friday and Saturday including fireworks Saturday night. Come on out and join us in the Valley for the 4th! Activities are located in Gypsy Hill Park and centered around the Gazebo (Bandstand Stage). Vendors, food, arts and crafts, and carnival will be available. It's been a year for bears as their numbers increase and they are found in populated areas including the city of Staunton. Monday, in Staunton's Gypsy Hill Park, a young black bear was tranquilized and captured by Al Bourgeois, a biologist with the Virginia Department of Game and Inland Fisheries ... something Al has done many times in the past. Read the article here. Last night we joined with Patriots from the Conservative Society for Action and a number of other groups to send a very clear message to Congressman Tim Bishop that the days of socialist nirvana have come to a screeching halt. Hundreds of fed up constituents swarmed his Town Hall meeting in Setauket, Long Island, to let him know that they are Taxed Enough Already and they did not appreciate a Nancy Pelosi clone representing them in Congress. So many people showed up that the parking facilities at the Setauket Community House was filled to overflowing and all available on-road parking was taken up for blocks around. By the time Bishop arrived he had to park three blocks away and run the gauntlet of Tea Party protesters! The look on his face was priceless as he finally got to the hall. Sounds similar to the Augusta County uprising by citizens in March when 1,000 turned out for the Board of Supervisors meeting to protest inflated real estate assessments. Americans are taking it to the streets to stand up for their rights. Check out the website for video of the protest and details of the meeting. My thanks to Dan for passing this along and for his part in planning and participating in the protest. STEVE DOOCY: "[I] know the bill is over 1,000 pages long. Have you have read it?" CAROL BROWNER: "Oh, I'm very familiar with this bill." DOOCY: "Have you read it?" BROWNER: "We have obviously been watching this for a very long time. I am very ..."
DOOCY: "I'm sure you've got an idea of it, but you have read it?" BROWNER: "I've read major portions of it, absolutely." DOOCY: "So the answer no you haven't read it. But you've read a big chunk of it." BROWNER: "No, no, no that's not fair. That's absolutely not fair." DOOCY: "No, I'm just asking you if you read the thousand pages." BROWNER: "I've read vast portions of it." peaceful days in the Sweet Virginia Breeze. The dedication of the Gloucester Post Office to the late Congresswoman Jo Ann Davis will be tomorrow, Tuesday, June 30, 2009, at 10:00 a.m. Guest speakers will include Congressman Rob Wittman, Delegate Brenda Pogge, Chuck Davis, Jacob Cheeks, and Pastor Bob Collins. This will be a special dedication to an exceptional lady who was well-loved by her constituents. Congresswoman Davis passed away in 2007 after a two-year battle with breast cancer. In the Senate, Minority Leader Everett Dirksen had little trouble rounding up the votes of most Republicans, and former presidential candidate Richard Nixon also lobbied hard for the bill. Senate Majority Leader Michael Mansfield and Senator Hubert Humphrey led the Democrat drive for passage, while the chief opponents were Democrat Senators Sam Ervin, of later Watergate fame, Albert Gore Sr., and Robert Byrd. Senator Byrd, a former Klansman whom Democrats still call “the conscience of the Senate”, filibustered against the civil rights bill for fourteen straight hours before the final vote. Read more over at The Write Side of My Brain. Lt. Gov. Bill Bolling: "Virginia's financial Bull Run?" Lt. Gov. Bill Bolling at last month's RPV Convention. We learned last week that Virginia will be facing another budget shortfall in the current fiscal year. Though the news seemed to surprise many people, it should not surprise anyone. Read the entire column at SixtyFour81.com. Friday's vote was 219-212. The legislation was supported by 211 Democrats and eight aisle-crossing GOP members: Reps. Mary Bono (Calif.), Michael Castle (Del. ), Mark Kirk (Ill.), Leonard Lance (N.J.), Frank LoBiondo (N.J.), John McHugh (N.Y.), David Reichert (Wash.) and Christopher Smith (N.J.). Forty-four Democrats voted against the bill, making the eight GOP votes all the more crucial. The 1,200-plus-page bill now goes to the Senate, where it faces an uncertain future. An 17 percent cut in greenhouse gas emissions by 2020. An 83 percent cut in greenhouse gas emissions by 2050. That 20 percent of all electricity in the United States be generated by renewable sources and/or more efficient methods by 2020. As written, the bill will cost American households an estimated $175 a year by 2020, according to the Congressional Budget Office. Erick Erickson over at RedState did a great job keeping the pressure on, sending out emails urging folks to contact their reps telling them to vote "no." Now that Americans may be more aware of the damage this bill could pose, perhaps more will join in to put the pressure on the Senate to defeat this bill. Blue Ridge Mountains are in background. Ronald Reagan's quote is especially important at this time in American history. Like millions of others, we are worried about our freedoms and want to preserve them for future generations. On the 4th of July, as we celebrate the independence of America's freedom from Great Britain, join in a tea party of fellow patriots. 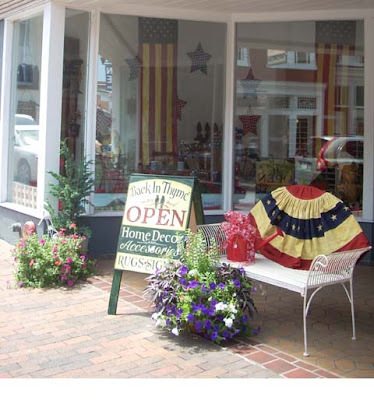 Front Royal is planning a rousing, patriotic tea party July 4 from 11:00 am-2:00 pm with flags, music, and speakers ... check out their Front Royal Freedom Rally website for all the details. All those who had planned to attend the Winchester event (those attending that event in April said it was absolutely, stunningly patriot and wonderful) have been invited to join Front Royal since Winchester has now put up more hoops for organizers to jump through. For those in or close to Martinsburg, W.Va., a rally is also planned for there. Check out the Martinsburg Tea Party Movement website for details. It's your country ... elected officials are your public servants and work for you ... Barack Obama does not speak for at least half the population of this country ... so stand up for your rights! 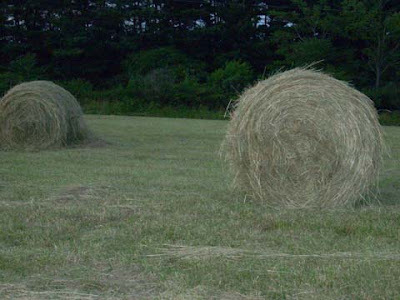 Hay bales in a SWAC area field. SWAC Niece tailgates while waiting for dark to signal beginning of movie. The choice that night was "Star Trek." 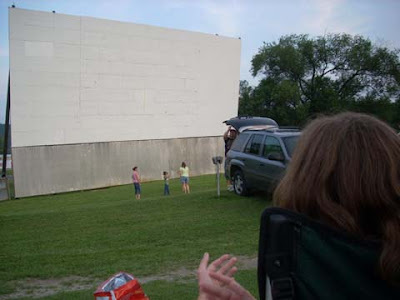 A short 30-minute drive from Staunton will find you at Hull's Drive-In Theater, located on Rt. 11 outside Lexington. The only not-for-profit drive-in the country, it has an interesting history. Hull's was operated by the Hull family from 1957 to 1999. After 42 years, it closed ... but many did not want to lose this community icon ... so a drive began to save it. They were successful and this year they are celebrating their 10th year as a not-for-profit drive-in with many volunteers pitching in to help. Open Friday, Saturday, and Sunday nights, the cost is only $6 per person (kids 11 and under are free) to see first-run movies and each night offers a double feature. If you stay for both movies, be prepared to be out late since movies do not begin until dark. The night we attended to see "Star Trek," the movie began at 9:20 pm and we left at 11:45 pm. If we had stayed for the second feature, it would not have been over until close to 2 am. A car load of us piled in and headed to Lexington on a recent Friday night, carrying subs and a cooler of water and soft drinks to tailgate before the start of the movie. We also carried entertainment to keep us busy when not people watching before the start of the movie. On the lawn in front of the outdoor screen, children played ... a dad and son pitched a baseball ... other kids played tag. Families parked down front ... couples parked near the back. Speakers played music from the 50s, 60s, and 70s ... the snack bar provided reasonably-priced offerings with everything from popcorn and sno-cones to onion rings, burgers, hot dogs, and BBQ. This weekend's double feature is Night at the Museum: Battle of the Smithsonian rated PG and State of Play rated PG-13. For a fun evening with the family ... or a date night with your significant other ... you may want to wander back in time to Hull's Drive-In. 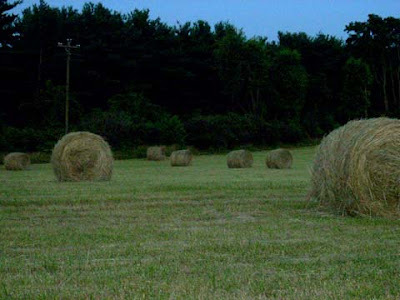 It's hay time in the Shenandoah Valley. sidewalk dining on Bevereley Street. can be found at Berry's Natural Way. 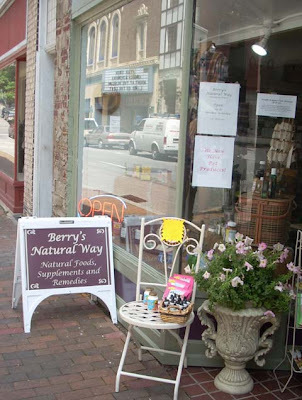 Berry's Natural Way on Bevereley Street has natural foods and products. 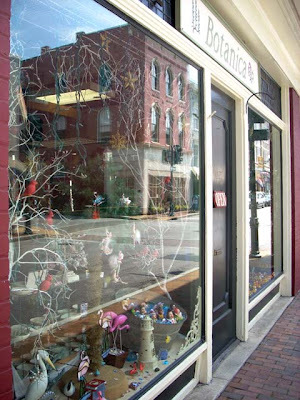 Sunspots in the Wharf area of Staunton offers handmade glass-blown ornaments, jewelry, garden art, gifts, and more. 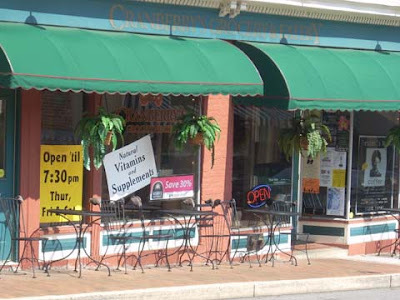 Cranberries on New Street offers sidewalk dining. Pen and Paper at corner of Beverley and New Streets offers fun and fancy stationery, invitations, printing needs, and more. Celebrate! 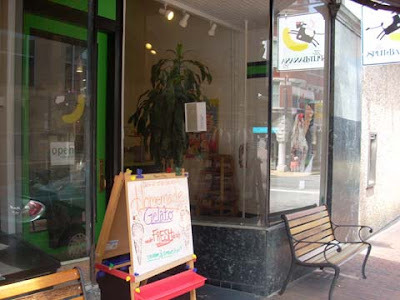 Located on Beverley Street, it offers greeting cards, party goods, fun items, souvenirs, and and fun! Cuddly souvenir bears with "Staunton" vests sit on a shelf at Celebrate! * Timber rattlers are found in the Shenandoah Valley and other mountainous portions of western Virginia. * The snakes are heavily bodied and can grow up to a length of more than 5 feet. * Timber rattlers have a coloration from yellow to black with darker bands across the body. * The snakes will not attack humans unless harassed. * During the summer, male timber rattlers travel as far as a mile to mate with females. History will be made today, and one of America's most prominent figures in news and entertatinment will help make the day even more memorable - by offering to shave his head - live on the air - all for U.S. Troops. TroopAThon co-host, Andrew Breitbart, has agreed to shed his famous locks for charity. He has agreed to have his head shaved live during the broadcast of Move America Forward’s military fundraiser “Honor Their Service” when, and if, donations surpass $1 million. The goal is to collect enough donations to send the largest shipment of care packages to U.S. Troops in history via an online broadcast. Breitbart will be interviewing what is already an impressive line-up that includes Rush Limbaugh, Gary Sinise, Kelsey Grammer, Jon Voight, Laura Ingraham, Mark Levin, Michelle Malkin, Carrie Prejean and many more. Today from 4-12:00 Midnight, Move America Forward, the nation’s largest grassroots pro-troop organization, will be hosting its 2nd annual “Troopathon” broadcast live from the Ronald Reagan Presidential Library. The event will be hosted by Melanie Morgan, co-host of the syndicated radio show “America’s Morning News,” Andrew Breitbart, who runs Breitbart.TV, and the “Big Hollywood” blog and Mark Williams, renown talk radio host. The goal of the project is to send care packages to troops in Iraq and Afghanistan. During the 8-hour event that will be broadcast on the internet and radio, viewers are encouraged to sponsor care packages for the troops as the guests and hosts discuss various topics related to supporting our military men and women. Last year, viewers donated more than $1.5 million to send care packages to troops. With the help of Carrie Prejean, we hope to surpass that number this year. An All-Star lineup of celebrities will team up TODAY for an historic effort to send the largest shipment of care packages ever to U.S. troops serving overseas. Celebrities, military figures, and leading politicians will participate in the “Honor Their Service” TroopAThon – an 8-hour Jerry Lewis style telethon that will be broadcast online at TroopAThon.org. Tune in, join in, and show our troops how much we care. Birthday greetings to fellow blogger Krystle over at Crystal Clear Conservative. She is a hard-working blogger, conservative, and fun to be around as we cross paths at Republican events throughout the year. Krystle participated with Bloggers Row at the RPV Convention in May but I especially remember her at last year's RPV Advance sitting in the back of the ballroom at the Homestead during the attorney general debate. Since no bloggers row had been set up, four of us improvised around a table with water pitchers and glasses ... Shaun and Jason Kenney, Krystle, and myself. Krystle balanced her laptop on her lap as she live-blogged the event while fellow bloggers Chuck Young from the Virginian Federalist and Alton Foley listened to the candidates. Here's hoping it's the best birthday you've ever had ... and for many more. Happy Birthday, Krystle! Perhaps Wednesday night's ObamaCare infomercial did not turn out quite the way ABC News or the White House planned. Call this a teachable moment, but even with ABC’s best-laid plans to kickstart the debate about health care reform and not allow the “Prescription for America” special to become an “infomercial,” as many have complained – the president spent more than twice as much time as his questioners vaguely answering or not answering the questions asked of him. But the network consistently presented the event as part of the need to fix a "broken system." When asked, every one of the 164 hand-picked audience members said they felt that health care needed to be changed. The network also allowed him to dominate the program with long-winded and vague answers. Out of the 75 minutes the network dedicated over the two programs (commercials excluded), the president managed to take 60 percent of that time: 45 minutes to give 19 vague responses – not exactly the “dialogue” advertised by ABC. In fact, at one point, the president went on for four minutes and 33 seconds to answer a question about government interference, the “Big Brother fear” as the questioner put it and how it would be paid for. In the next segment Gibson pleaded with the president to keep his response to the next question shorter. No Republican presence was allowed during this propaganda hour. The American people need to ask tough questions about universal health care and how a country whose back is already breaking with a heavy financial load will be able to pay for a $3 trillion program. I will note that the older folks I know who lived through the Depression are hunkering down and preparing for another. One gentleman told me he is afraid this one will be worse than the last. Universal health care? Obama should be thinking about how to prevent this country from slipping into a financial abyss. - The Cheese Shop: Located on Rt. 608 in Stuarts Draft, this bulk foods Mennonite-run shop offers hundreds of choices in fresh spices; bulk foods such as nuts, trail mix, oats and brans; deli meats and cheeses; snacks; gluten-free products; sugar-free products. Closed Sunday but open Mon-Fri 9:00 am-5:30 pm and Saturdays 9:00 am-5:00 pm. 2366 Tinkling Spring Rd, Stuarts Draft, VA 24477. Phone: (540) 337-4224. 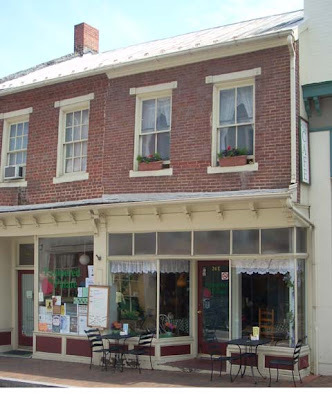 - The Buckhorn Inn: Full service Bed & Breakfast located 12 miles west of Staunton. Stop by overnight or come for dinner. Buffet-style restaurant Thur-Sat 4-9:00 pm. Wireless internet available as well as satellite TV. Phone: (877) 337-8660. 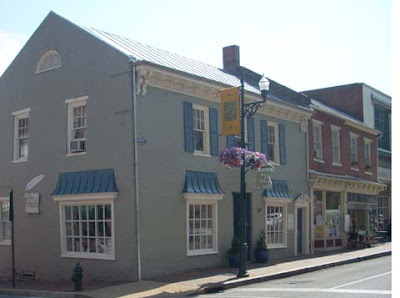 - American Shakekspeare Center: Spend an evening back in time in the Blackfriar Theatre in downtown Staunton or take one of the playhouse tours held Monday-Saturay. Check for play schedule. Phone: (877) MUCH ADO. I-81, exit 222 to downtown Staunton. 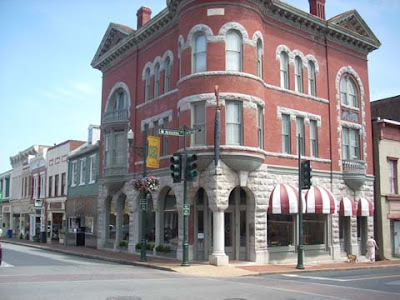 - Stonewall Jackson Hotel & Conference Center: Located downtown adjacent to the Blackfriar Theatre. Newly renovated to include wireless internet, adjacent parking deck, indoor pool and fitness center, dining. Phone: (540) 885-4848 or (866) 880-0024. - P. Buckley Moss Museum: A beautiful brick building overlooking the Blue Ridge Mountains houses the artist's works. Phone: (800) 343-8643. 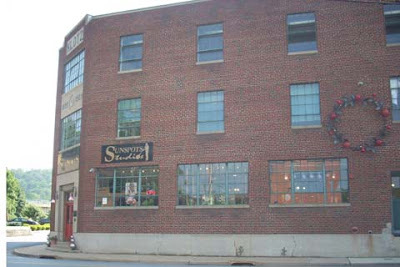 - Dayton Farmers Market: Amish soft pretzels, handmade candies, gifts, furnishings, dining. Open Thur-Sat, 9:00 am-6:00 pm. Phone: 540-879-3801. 3105 John Wayland Hwy (Route 42), Dayton, VA 22821. 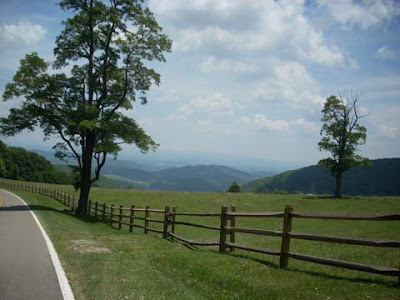 - Shenandoah National Park Lodging: Offering accommodations and restaurants for visitors. Phone: (866) 776-4121. Email: Shenandoah@aramark.com. - Shenandoah River Outfitters & Cabins offering rafting, canoeing, and kayaking as well as camping and log cabins. Phone: (800-6CANOE2). - Green Valley Bookfair: June 27-July 12, 9:00 am-7:00 pm daily. Save 60%-90% off retail on thousands of books. I-81, exit 240; 2 miles east (just south of Harrisonburg). Phone: 800-385-0099. - Massanutten Resort: Featuring year-round fun. Indoor-outdoor water park, golf, concerts, outdoor recreation, dining, condo rentals. Phone: (800) 207-MASS or (540) 289-9441. - Monticello: Famous home of the third American President Thomas Jefferson. Historic, picturesque, American history. Phone: (434) 984-9822. - Paramount Theater: Located in downtown Charlottesville. Offering shows, musicians, plays throughout the year. Check for schedule. Phone: (434) 979-1333. - Stonewall Jackson House: A part of Virginia history, this historic house was the home of this Civil War leader. Guided tours of house and garden. Phone: (540) 463-2552. - The Natural Bridge: One of the natural wonders of the world, Natural Bridge was once owned by Thomas Jefferson. Dining, lodging, tours. Phone: (800) 533-1410. I-81 to exits 175 & 180. Near Blue Ridge Parkway. - Virginia Safari Park: 180-acre drive-thru adventure for the family. Hundeds of exotic animals roaming freely as you drive the three miles of winding roadway. Zebras, bison, elk, antelope, deer, ostriches, llamas, monkeys, kangaroos, giraffes, giant tortoises, flamingos, warthogs. Picnic area, petting zoo. Phone: (540) 291-3205. - Mountain Lake: Beautiful turn-of-the-century stone hotel; cottages. Dining, canoeing, kayaking, paddleboating, volleyball, badminton, croquet, horseshoes, giant checkers or chess, bocce, tennis, archery, hiking, sauna, hot tubs. No TVs and, believe me, they are not needed! Sit in a rocker on the huge front porch or join in the many activities. Breakfast and dinner included. Phone: (800-828-0490). New McDonnell ad ... "Resurgence"
FREDERICKSBURG- Bob McDonnell, Republican gubernatorial nominee and former Attorney General of Virginia, visited Jabberwocky Children's Books in Fredericksburg today to unveil a number of proposals aimed at assisting Virginia's small business owners. McDonnell was joined at the bookstore by store owners Mona Albertine and Linda Pisenti, and State Senator Ryan McDougle (R-Hanover). The small business policy proposals come at the same time that McDonnell is airing a new television commercial focused on his commitment to working across party lines to bring new jobs and more opportunities to every region of Virginia, and help Virginia's small business owners and entrepreneurs. · Update and combine Virginia's four different small business guides into one user-friendly document: "How to Start or Expand a Business"
· Promote Virginia as the "Best State in America in Which to Open a Small Business"
McDonnell will make further small business policy proposals in the months ahead. Speaking about his focus on helping Virginia's small business owners and creating new jobs, Bob McDonnell remarked, "Small businesses are the backbone of Virginia's economy. 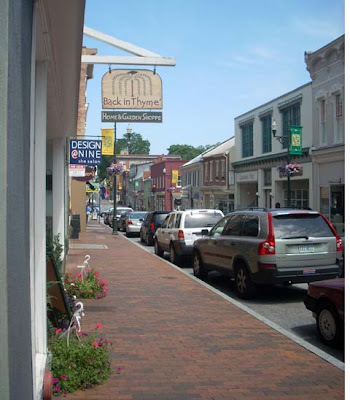 97.5% of Virginia's businesses are small businesses. These small businesses account for approximately 75% of new job growth in the Commonwealth. And total employment by small businesses is roughly 55% of the job force in Virginia. A small business really represents the dream come true of the owner. That individual has dared to take a risk and open up a small business. In so doing they employ their fellow citizens, add needed revenue to state and local coffers, and strengthen the fabric of their communities. We need a resurgence of this entrepreneurial spirit in the Commonwealth. As Governor I will make Virginia the best state in American in which to open a small business. And I will make Virginia the most business friendly state in America for small business owners. This will lead to new jobs and more opportunities in every region of Virginia." Mona Albertine, the owner of Jabberwocky Children's Book Store, noted at today's event, "Bob McDonnell understands the importance of small businesses like Jabberwocky and what we do for our local economy. Anything that can be done to help streamline and expedite the process for future small business owners is very much appreciated." Ms. Albertine's comments were echoed by Thomas Johnson, of Thomas A. Johnson Furniture Co, Inc. in Lynchburg, who remarked, "It's refreshing to learn that Bob McDonnell will stand up for the little guy and not only encourage small business development across Virginia, but also remove the bureaucratic red tape so that future entrepreneurs will have the opportunity to truly live the American Dream." Gary Barlow, who owns Frank's Trucking Center in Chesapeake, commented, "In an economy where every little bit helps, it's nice to know that we will have someone in the governor's mansion that will make our life a little bit easier. As a small business owner, I commend Mr. McDonnell for understanding the pivotal role we play in the communities we serve. Anything he can do to limit government involvement and make it easier for small business owners to open and maintain their establishment is a big win for all Virginians." McDonnell's latest television advertisement, "Resurgence," continues his focus on creating new jobs, helping small business owners, and bringing more opportunities to every region of Virginia. Check Bob McDonnell for Governor website for more information about this plan. President George W. Bush joins Move America Forward's "TroopAThon"
Move America Forward's second annual "TroopAThon" Care Package Drive is coming up on June 25. Last year was a booming success ... let's do it again! Rush Limbaugh, Ann Coulter, Elizabeth Hasselbeck, Sean Hannity, Melanie Morgan, Buzz Aldrich, Michelle Malkin, Jon Voight, and Gen. David Petraeus. Right now - as you read this email - there are over 100,000 men and women of the United States military who are serving overseas in Iraq & Afghanistan. They were not drafted to serve, they volunteered on their own free will to serve the country they love and respect. Now an all-star lineup of conservative leaders, patriotic celebrities, and pro-troop advocates are teaming up for a historic effort: to send the largest shipment of care packages to U.S. troops serving overseas in history. And they need your help! Right now our troops are in a foreign land away from their families, friends and loved ones. Their efforts - and their successes in undertaking their missions - are rarely reported in the news. It seems only bad news catches our attention. But each day our military men and women selflessly serve this nation with honor - and we ask you to join with us in showing your support for their service to this nation. Some of our troops will never come home from their missions. Others of them will forever be impacted by the dark side of war that comes as part of the price some pay in serving this nation bravely and honorably. We are asking YOU as a fellow patriotic American to join with us in sending this message to our troops: We will ALWAYS appreciate you and your service... we will NEVER take for granted the risks you face or those who have given their lives in service to this nation. So please, join with us in this historic effort to shower our troops with tens of thousands of care packages. When you sponsor a care package we'll assemble it with a box full of goodies, send a personalized note FROM YOU, and send it direct to a unit serving in Iraq or Afghanistan. Our final push will be on June 25, 2009, when we conduct our second annual "Honor Their Service" TroopAThon. You can learn more about this effort - HERE. Thanks so much. It really means a lot to us here that you took a moment and made the effort to show our troops serving overseas - our fellow Americans - that you care. There's a blog roundup by Michael over at The Write Side of My Brain with the latest conservative posts on Campaign 2009. It's a great condensed listing. Mary Gray (left) and Betsy Bell Mountains. Today, the full United States Fourth Circuit Court of Appeals, in a 6-5 ruling, upheld Virginia's Partial-Birth Infanticide ban. The court was acting upon an appeal of their earlier divided panel decision in May 2008 which struck down Virginia's law. The appeal was secured by then-Attorney General Bob McDonnell. "I am pleased that the full U.S. Fourth Circuit Court of Appeals has upheld Virginia's Partial-Birth Infanticide Ban. Virginia's ban was passed by the General Assembly with bipartisan support. The law reflects the will of the people of the Commonwealth and is substantially similar to the federal ban on the procedure which was ruled constitutional by the Supreme Court of the United States. I congratulate Attorney General Bill Mims for his successful handling of this appeal." So said Tom White of Virginia Right, our boots-on-the-ground blogger in Richmond with photos and update on the Richmond Tea Party protest by a couple hundred folks (and growing) holding signs protesting ABC News' broadcast of Barack Obama's universal health care proposal. Without voices from the other side, it was a one-sided presentation (propaganda) and all offers by anti-universal health care proponents, even for paid advertising, were rebuked by ABC News. "I took a few photos of the crowd and enjoyed the positive atmosphere of change in the right direction advocated by all." Great job, indeed. Thanks Richmond-Chesterfield for standing up! Starting at 10:00 PM EDT, the RNC will be live-blogging from www.gop.com/liveresponse during President Obama's Government-Run Health Care Infomercial. Since ABC won't allow alternative views to be heard during the hour-long "primetime special," the RNC will be doing a minute-by-minute fact-check on all of President Obama's claims on government-run health care. The Gadsden flag, that bright yellow banner with an illustration of a rattlesnake and the words, "Don't Tread On Me," has one Democrat blogger in a stew over conservatives' use of the flag. However, Alton over at Eschew Obfuscation isn't letting him get away with it and other conservative bloggers have taken note, too. Why do liberals insist on telling us what we really mean whenever we say or do something? I know a lot of conservatives. One thing most of us are most definitely not is shy when it comes to speaking our mind. If we mean something, we generally go right ahead and say it. Gets me in trouble sometimes. But I was raised that way. “Mealy—mouthed”. That what my granddad called it when someone he was dealing with tried to say one thing while meaning another. Ain’t no mealy—mouthed conservatives ’round here. Hear, hear! You think the Dem knows yet that he stepped into a rattlesnake den? H/T to Carl at Spark It Up!! Roanoke Times: "Where did Tim Kaine go?" The Roanoke newspaper has picked up on the Freedom of Information Act (FOIA) request that was filed by the Republican Party of Virginia requesting Democrat Gov. Tim Kaine's travel records since becoming DNC chairman. When Gov. Tim Kaine started moonlighting as chairman of the Democratic National Committee, he promised his night job would not hinder his day job in Richmond. He should prove it by releasing travel records and information about who is footing the bill for his trips. It sounds as if the Kaine administration will refuse on two points that are outlined in the editorial. Republican Party of Virginia Chairman Pat Mullins today congratulated Tim Kaine for creating what appears to be the first ever two-day work week in any state in America. Facing criticism for his extensive, yet secret, travel schedule as chairman of the Democratic National Committee, Kaine explained through a spokeswoman that he conducts national party business mostly on the weekends. Four of the six events highlighted by Virginia Republicans occurred on Wednesday, Thursday or Friday. "Even the governor is allowed to have a little fun on the weekends," said Kaine spokeswoman Lynda Tran (Richmond Times-Dispatch, June 20, 2009). On Friday last week, the Republican Party of Virginia unveiled an Internet video spotlighting Kaine’s travel schedule and his reluctance to disclose to Virginia citizens where he is at any given moment. “Kaine said he will do the DNC job on personal time, evenings and weekends,” reported the Associated Press on January 6, 2009 (“Kaine Says He’ll Limit Time Spent As Party Leader”). "I think it will be an electronic gig anyway, using e-mail and phone and others,” Kaine added. “Apparently, part of the ‘electronic’ portion of Tim Kaine’s ‘gig’ at the DNC involves walking around the pool at the $800 per night Fontainebleau Hotel in Miami,” Mullins said. “That’s good work, if you can get it. On Friday, June 19, 2009, Mullins submitted a Freedom of Information Act request to the governor’s office, seeking information pertaining to the daily schedule of the governor dating back to January 2009, when he became chairman of the DNC. It further requests records pertaining to expenses related to the use of the State Police Executive Protection Unit assigned to guard the governor's safety. Under Virginia's FOIA law, the governor's office has five working days to respond or can obtain an additional seven days if extra time is needed to compile the requested information. The office can comply completely with the request, issue a partial collection of documents while explaining what legal exemptions allow them to omit others, or deny the request completely while explaining which legal exemptions allow them to refuse the request. So asked Fox News Channel's Major Garrett of President Barack Obama at Tuesday's news conference on Iran. Watch the video as Obama is asked the question, "What took you so long?" Obama shows favoritism to Huffington Post blogger? In what appeared to be a coordinated exchange, President Obama called on the Huffington Post's Nico Pitney near the start of his press conference and requested a question directly about Iran. Check out the updates to the story and video. in the central Shenandoah Valley. Back in Thyme has gifts and furnishings. has health food and natural products. The "umbrella" building at corner of Beverley & N. Augusta Streets. 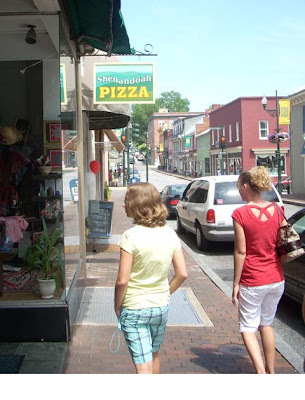 Shenandoah Pizza on Beverley Street. Augusta Board of Supervisors ... spending out of control? 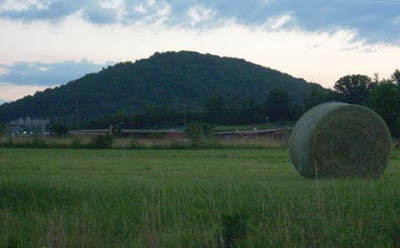 At a time when many Augusta County residents are struggling with lost jobs and economic hard times, the Board of Supervisors seems determined to continue spending county funds on projects that may be deemed "wants" instead of "needs." A newly created $69,000-a-year economic development director's job was recently voted on by supervisors even as 18 employees at the Government Center were losing their jobs due to cutbacks. There are so many questions and so much information to share about that issue that more will be in a separate post. Today's Waynesboro News Virginian provides details about a proposed $2.4 million renovation project on the county's Fishersville library, a project being pushed by Supervisor David Beyeler. However, Supervisor Tracy Pyles questioned the prudence of such a project in these economic hard times. That's $2.4 MILLION -- the county has less than $600,000 set aside for the project. A new children's wing was completed last year that added computers and 4,000 square feet of new space. Also discussed at yesterday's staff meeting was matching funds of $29,225 for a Ruritan Club ball field in New Hope. That would be a total of $58,450 to improve a dirt recreational playing field for children after school. Again, citizens have tightened their belts so is that the best use of hard-earned tax money? "Needs" versus "wants" ... the county should take a hard look at its spending. Two D.C. Metro trains crashed into one another at 5:00 pm Monday causing two deaths and unknown injuries. Fox News film footage shows it appears to have happened outside. A similar wreck inside the tunnels could have caused far more damage and possibly more deaths. Many times we have ridden the Metro and it has always been a safe experience. Our sympathies with the families of those involved. 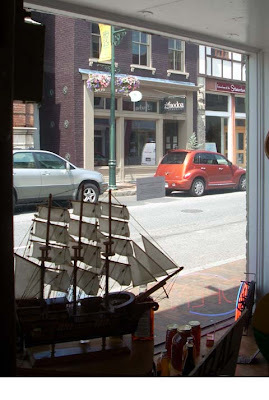 When it's hot outside the place to go in historic downtown Staunton is the Split Banana Ice Cream Parlor for tasty homemade gelato, sorbet, and ice cream. With SWAC Niece in town, the flavor of choice was a yummy mocha. 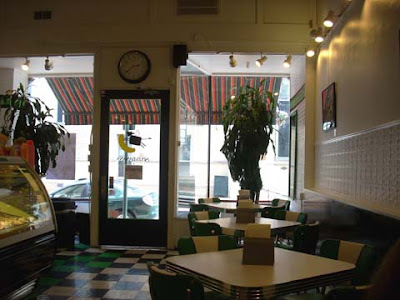 Inside the Split Banana is a retro style with black-and-white checked floors and funky green accents. 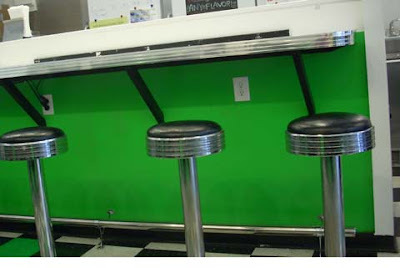 Choice of seating includes tables, booths, or stools at the counter. View is looking out toward Beverley Street. Stools at the counter were filled shortly after this photo was taken as two moms and five kids arrived after playing at Gyspy Hill Park. Each child parked on a stool and waited for their cups of ice cream to be delivered to them. 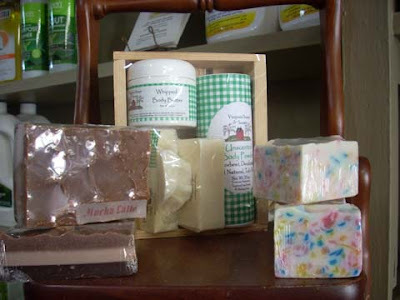 All products are homemade at the Split Banana. During the 1990s, conservatives referred to CNN as the "Clinton News Network" based on the fact that crazy old Ted Turner's news station was so ridiculously biased in favor of the Clinton White House that no honest person could deny it. Now, as Republican National Committee Chairman Michael Steele has sardonically pointed out, ABC has become the "All Barack Channel." The American Broadcasting Company, as it was known back when it still pretended to be fair and balanced, has gone far beyond the days of CNN's fawning coverage of the felon-in-chief, his choleric bride and the gang that couldn't lie straight. The mainstream media is so in love with Barack Obama that they continually try to one-up each other in their sycophantic coverage of their new president. But ABC has raised the stakes by taking up residence in the White House for a day in order to spew the Official Party Line on health care. I don't want to hear whining from Democrats about Fox News Channel where a continuous presence of Democrats representing the other side of the issue is on display. It's called debate ... what ABC News is doing is called propaganda. Was politics involved in recall of Zicam? First, Barack Obama began verbally going after Rush Limbaugh shortly after entering the White House. Second, the FDA is a government agency. Bear with me here as I work through this. We've all heard about the recall of Zicam Cold Rememdy, that homeopathic medication that helps prevent or ease cold symptoms. Zicam is advertised and promoted by conservative radio talk show king Rush Limbaugh. A box of Zicam gel swabs sits permanently on my desk. Why? Because the stuff works! Today on Glenn Beck a woman caller said she could no longer find the product in stores. It has been removed which, in turn, removes the decision from the consumer about using the product. Nanny state government at work once again? My first question when hearing the recall news was, "Did consumers follow the directions?" Along with the required warnings, directions for use read: "Apply medication just inside first nostril. ... Do not insert swab more than 1/4" past nasal opening." Just a thought ... wonder how many people swabbed the entire inside of their noses? They may have thought if a little was good, perhaps more would be better? Or just didn't read the directions at all and swabbed away? I used to work in the medical field and learned one sure thing: Many people do not read directions. On Tuesday, the U.S. Food and Drug Administration warned the company to stop selling nasal versions of its Zicam cold remedy and urged consumers not to use them after more than 130 people reportedly lost their sense of smell. Shares of the company have tumbled since the warning, falling as much as 70 percent. On Thursday its shares continued to fall, trading down .3 percent at $6.11 in early afternoon on the Nasdaq. Matrixx must seek FDA-approval if it wants to continue selling Zicam zinc products administered via the nose. Hemelt said the company was not likely to do so, saying the process would take years and be "highly expensive." While the company would try to convert users of Zicam's nasal products to oral versions, it would likely see an estimated $5 million in lost sales, Hemelt said. The other $5 million in losses was likely to come from new advertising efforts to reach out to consumers, he added. FDA's warning applies to Zicam Cold Remedy Nasal Gel, Zicam Cold Remedy Nasal Swabs and Zicam Cold Remedy Swabs Kids Size, but does not affect Zicam oral zinc tablets or lozenges. Glad I'm stocked up on Zicam gel swabs because I will continue to use them. Meanwhile, a company is going to suffer a huge financial hit and the question remains in my mind ... did it have anything to do with the fact this company was highly promoted by Rush Limbaugh? Democrat president Barack Obama has spent the past months practicing Chicago-style politics as deftly outlined by Michael Barone, senior political analyst at the Washington Examiner, with perhaps the most important realization being the Chicago-style governing of this president. First, Obama likes to execute long-range strategies but suffers from cognitive dissonance when new facts render them inappropriate. Second, he does not seem to care much about the details of policy. Third, he does business Chicago-style. Good analysis of this president who proposed to be for all the people, who proposed change, who proposed hope ... but once in office went immediately to work for the Democrats. In the words of a friend who coined a new word, as Obama continues catering to the left and jamming his policies down the throats of Americans, he is committing Obamacide. Our prayers and thoughts are with Maureen McDonnell after the loss of her mother last Wednesday. Gerry Gardner was 78 and lived in a Northern Virginia retirement community with her husband. As the Bob McDonnell for Governor campaign slowed down out of respect for the family, plans were made for the funeral. A loss is never easy ... prayers go out for the entire McDonnell-Gardner family at this sad time. Retired Richmond Times-Dispatch editor Ross Mackenzie makes it clear in his column today that he is not impressed with Barack Obama's desire to see socialized medicine in this country. He foresaw the day, now rushing at us, when the federal government would be setting rates, approving procedures, and broadly regulating the medical profession. Great column ... read it for insight from someone close to the medical field. ... which means "voice" in Farsi. Just as the young man standing before a tank in Tiananmen Square became the symbol of that uprising 20 years ago, will this young woman's image become the symbol for Iran's uprising? If President George W. Bush had backtracked on issues like Barack Obama does, the MSM would have howled with glee as they excoriated him once again in their hate-hate relationship with the 43rd president. Wow, it didn’t take long for a “pay no attention to that shyster behind the curtain” moment, did it? It’s a Chicago back-alley shell game, with our health and health care insurance and our choice of medical providers and trillions of taxpayer dollars, all being shuffled about under walnut shells… very suspicious. And troubling. And with a Bush White House the MSM would have made it front page headlines. Today is the longest day of the year -- the first day of summer in the Shenandoah Valley. 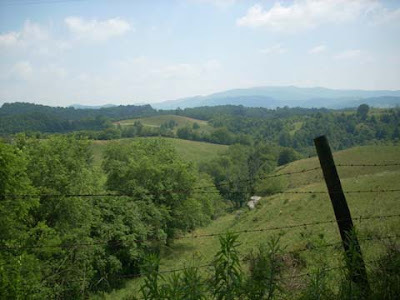 To live here is to enjoy everything that brings tourists to the area ... the climate is great -- warm days, cool nights, lower humidity than points east of the Blue Ridge, views of the Valley and mountains. Sitting on my deck I can watch deer at the far end of the yard at the edge of the woods ... turkeys and bears roam through the area. 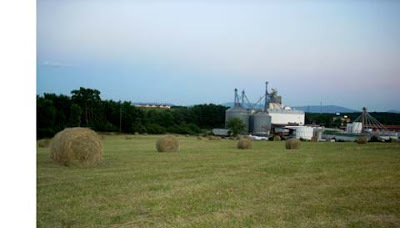 The views of the mountains are soothing, the hayfields are picturesque. Occasionally an eagle (yes, an eagle) soars high overhead. The vegetable garden is thriving since we've had sufficient rain this spring. I'm looking forward to squash, corn, beans, potatoes, onions, cukes, a wide variety of peppers, and a nice selection of tomatoes. My flowers are enjoying the benefit of tender loving care. Many varieties of annuals are planted in the window boxes; dozens of perennials are blooming throughout the yard. My yard is much like a memory garden with flowers passed on from my mom, grandmother, sisters, aunts, and friends. As plants grow and multiply and need to be divided, friends and I share with one another. The trees, shrubs, and grass are green and lush and it smells like ... ah, fresh-mowed grass! ... on these hot days. It's summertime in the Valley. So today is the first day of summer ... and I was thinking about another first day of summer when I was around 30 when SWAC Husband and I visited with friends who were living in Charleston, S.C. On June 21 of that year we all boarded their boat and headed out into Charleston Harbor to visit historical Fort Sumter, walking its pathways and absorbing the history of it all. The experience made an impression on me because we commented several times throughout that day that it was the first day of summer, the longest day of the year, and it was HOT on the salt water -- mid 90s -- with barely a breeze. It was a memorable event that I recalled today while enjoying the present first day of summer in the Valley with the temperature in the mid 80s and breezy. My step-dad was different from Dad in that he was an engineer who had a college degree. He had also been in the Navy (just as my dad had) right at the end of World War II so he never saw combat. He had grown up in Richmond, riding his bicycle to the corner market, working as a soda jerk in the nearby pharmacy, editing his high school newspaper, and experiencing an entirely different Depression-era childhood than my dad who lived in rural Virginia. My step-dad's father was one of those who began WRVA 1140-radio in Richmond. The history of all that can be found in my parents' house and it is fascinating. His dad also was one of the original group that pulled together the PBS station that is located in Chesterfield County off Robious Road. Much of the archived memorabilia for that and WRVA radio was given to the Valentine Museum in Richmond. My first memory of Cal was when he showed up at Mom's house one evening and, even though I was married and living away from home, I was at the house to mow the grass (I took care of much of that after my father passed away). I answered the front door in grass-stained shoes and met a friendly man who was there to pick up my mom to go out to dinner. The rest, as they say, is history. They married ... and my sisters and I gained four new siblings ... two brothers and two sisters including a Korean step-brother. My step-dad is still a significant part of our lives, and he and Mom are still perking along in their 80s. My husband ... is my best friend. We have been married for years, have two children, and can still sit and talk for hours. He has been a great dad to our two children who are now 25 and 21. It was because of him that I was able to stay home and raise our kids ... we educated them at home and sent them to college where our son graduated from James Madison University and our daughter currently attends BRCC. Over the years he played baseball in the front yard with the kids and swam with them and hiked with them. He passed along to them his love of yard work and gardening but, most of all, he passed along the need to be responsible citizens in this world and to work hard at whatever they choose to do. It's Father's Day and, once again, my dad is not here. He passed away in 1975 at the age of 51 ... cancer took him from us. There's a country song by Diamond Rio called "One More Day" ... and everytime I hear that song I think of my dad. It's been years since death took him away and, yet, a word or song or thought can bring me to my knees as I continue to feel the loss of a man I admired and respected and miss to this day. He was funny, easy-going, and hard to anger ... but when he angered, look out. He was a stern disciplinarian who had a thundering velvet hand when we had misbehaved. He was a deacon in our church ... a Sunday school teacher for the 12-year-old boys ... he hosted them at our house once a year for their annual campout. My dad loved to camp in the Shenandoah National Park along the Skyline Drive. We couldn't afford pricey vacations so my parents took us to the mountains from the time we were young. Dad was a naturalist before it became fashionable. He was mindful of nature, teaching his girls to leave the flowers for others to enjoy. He taught us to pack out our trash, be respectful of the animals who lived there, and enjoy that beautiful part of Virginia. We still enjoy that beautiful part of Virginia. 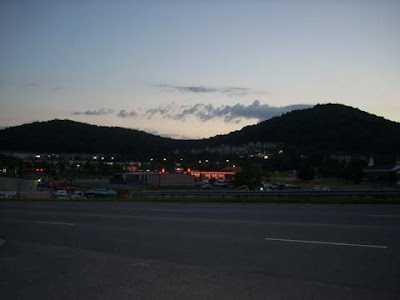 At the age of one, my parents took me for my first camping trip to Big Meadows Campground ... our growing-up years were spend enjoying vacations along the Skyline Drive. Though Dad's not physically with us, I carry his memory with me and honor him by remembering and practicing what he taught all those years ago. Originally posted on Father's Day 2007. It is nice to have a strong, articulate leader at RPV ... and Pat Mullins is proving again that he is up to the task. His latest move has been to file a Freedom of Information Act request for Democrat Gov. Tim Kaine's travel expenses now that he is pulling double duty as Governor of Virginia and Chairman of the Democratic National Committee. Are the lines becoming blurred ... is DNC paying for what DNC should pay for? So where was Tim Kaine when this request was filed? In Kansas City, Missouri, headling a fundraising luncheon for Organizing for America, a political group established by Barack Obama. Mullins’ FOIA request seeks information pertaining to the daily schedule of the governor dating back to January 2009, when he became chairman of the DNC. It further requests records pertaining to expenses related to the use of the State Police Executive Protection Unit assigned to guard the governor’s safety. Mullins was joined by Del. Chris Saxman (20th District) in a media conference call to unveil a brief video that highlights the Virginia economy and Kaine’s stealthy travel habits. The Kansas City Star posted a blurb on its website June 16th noting Kaine’s trip to that city, initially referring to him as the “former” Governor of Virginia before a hasty correction was made. Had the Star not made mention of the trip, Virginians would have been unaware that their elected governor had left the state for a political function. Additionally, the Washington Post found out that Kaine was in Chicago last week only because their bureau reporter happened to spot him while he was in town speaking to a DNC group. Under Virginia’s FOIA law, the governor’s office has five working days to respond or can obtain an additional seven days if extra time is needed to compile the requested information. The office can comply completely with the request, issue a partial collection of documents while explaining what legal exemptions allow them to omit others, or deny the request completely while explaining which legal exemptions allow them to refuse the request. On, Wednesday June 24th, ABC will spend the day with Obama in the White House promoting Obama's Nationalized Health Care Agenda. A one hour prime time broadcast without any serious opposition will be aired. Tea party and other like-minded groups across the nation are planning protests at their local ABC affiliates on June 24th. The Richmond protest is organized by local 912project groups. Please Join Richmond Tea Party at this important protest. Harrisonburg-Rockingham Clerk of Court Chaz Evans-Haywood will be the guest speaker on Valley Edition this Sunday, June 21, to discuss the progress he has achieved at the Courthouse since becoming Clerk. Chaz talked to a packed house at Harrisonburg's First Friday on June 5 as about 60 folks turned out to see slides and hear about the discoveries in the nooks and crannies and the hidden secrets into the past of the historic courthouse. Chaz is willing to present a program of his discoveries to civic, church, or other groups who may be interested. Contact him if interested. Meanwhile, tune in Sunday for a slice of history. Could this happen in America? In America, Democrats led by President Barack Obama are jamming tax increases, stimulus bills, bailouts, out-of-control spending, and an upcoming universal health care program down the throats of hard-working Americans. 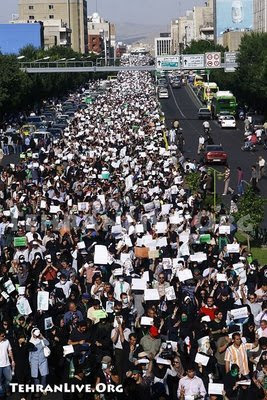 As Obama pushes his socialism agenda and as tea party tax protests continue to grow, one has to wonder while watching the protestors in Iran if that could happen in America. We are a nation simmering with discontent. It crosses all political and socioeconomic lines as demonstrated by this letter from a former Democrat who just wants to see someone in leadership ... lead. RICHMOND – Republican Party of Virginia Chairman Pat Mullins today called upon Democratic candidate for governor Creigh Deeds to publicly state his position on the proposed “Cap and Trade” legislation currently before Congress. Cap and Trade is a scheme in which entities that pollute in amounts exceeding a government-imposed limit would be forced to buy “credits” from entities which pollute under the limits. Many analysts have concluded that the idea would increase costs to consumers and severely limit the ability of private companies to create jobs. “In this time of economic crisis, every policy that can influence job growth has increased importance. Cap and Trade is certainly near the top of the list. This idea is a lethal job killer – based on liberal orthodoxy and not science. The estimated costs to a middle income family are well over $1,000 annually, but range up to over $2,100 a year for other families. Additionally, the burden on private enterprise would be substantial, limiting the ability of businesses to create jobs and spur economic growth. Taking a cue from his dad, the 41st president of the United States, former President George W. Bush went quietly into the night when he retired from the White House, leaving the spotlight and allowing Barack Obama to step into that leadership position. After being pummeled by his successor, the 43rd president ends his silence on America's slide into socialism and timidity. He reminds us leadership is not something that comes off a teleprompter. Perhaps tired about being publicly blamed by the current administration for all our current ills, Bush spoke out in Erie, Pa., on Wednesday at the 104th annual gathering of the Manufacturers and Business Association. President Bush stood his ground against Obama and the current out-of-control White House by addressing the stimulus bill, Guantanamo, Freddie Mac and Fannie Mae, terrorism, and more. Good editorial. Can the GOP stop ObamaCare? Glenn Beck: "The letter everyone should read"
The Journey: "More on snakes and bears"
Krauthammer: "How Fox News Opened America"
Pat Mullins "moves out and draws fire"
Presidential election in Iran too close to call? Fred Malek: "Bob McDonnell will win in Virginia"